Techno Mobile has expanded its portfolio of Camon i series of smartphones and launched today Techno Camon i4 smartphone. The USP of this phone is its triple rear camera, 16MP selfie camera and 6.21 inch HD+ display with Notch design having an aspect ratio of 19:5:9. You can also hide Notch on the display like OnePlus 6 device. This phone is priced Rs. 9599 for 2GB RAM + 32GB of internal storage variant and Rs. 11,999 for 4GB RAM + 64GB of storage and comes in four colors of Midnight black, Aqua blue, Champagne Gold and Nebula Black. The Camon i4 sports a 6.21 HD+ Display with resolution of 120×720 pixels, 19.5:9 aspect ratio and 88.6% screen to body percentage. This phone is powered by Helio A22 (MTK 6761) 2.0 GHz 64 bit Quad-Core Processor combined with 2GB RAM and 32GB/ 4GB RAM and 64GB of internal storage which can be further extended upto 256GB via microSD card. This phone has 3 in 1 slots (2SIM for 4G VoLTE support+dedicated 1SD card slot). This phone is packed with Li-Polymer 3500 mAh battery with Rocket Charging. On the imaging front, this phone is packed with Triple Rear Camera set-up comprising of 13MP Primary camera with f/1.8 aperture + 2MP (depth sensing lens) + 8MP ultra wide camera upto120 degree. The rear camera set-up has quad rear flash and supports 8X Digital Zoom. The rear cameras come with various modes and features such as Wide Angle Mode, AR Mode with 14+ localised stickers, Bokeh Mode, HDR, Beauty, Auto Scene Detection with 8 independent scenes like Portrait, backlight, blue sky, night scene, document, sports etc. For selfies, it is armed with 16MP Selfie Camera with f/2.0 aperture, 2.0um pixel (4 in 1) Big Pixels & Night algorithm 2.0 for capturing brighter selfies. The front camera comes with various featuresn such as HDR, Bokeh Mode, Beauty, AR mode, Screen Flash and support for 4X Digital Zoom. 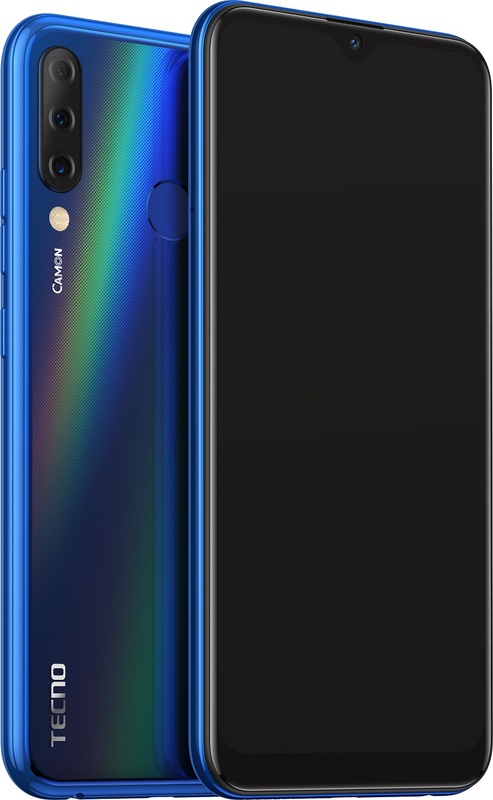 For security, this phone incorporates Anti-oil Fingerprint sensor on the back and AI Face UnLock feature. For connectivity, this phone offers various options of Dual 4G VoLTE, WIFI 802.11 b/g/n, Bluetooth 5.0, GPS,GLONASS and AGPS. It also comes with various sensors such as G, Proximity and Light. 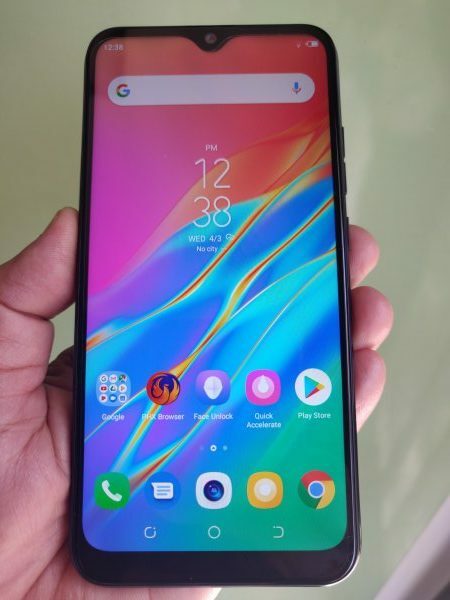 This phone runs on HIOS 4.6 based on Android 9.0 Pie.